Making Meat-Eating Look Green | A Practical Peacemaker Ponders . . . In the current (July/August) issue of Mother Jones, Associate Editor Kiera Butler questions the “greenness” of eating plant foods vs. eating meat in “Get Behind Me, Seitan: Why the vegetarian-equals-green argument isn’t so cut-and-dried.” Right out of the starting gate, Butler tells us that until recently she had been a lifelong vegetarian. Wow, lifelong– that’s unusual and, among longtime committed vegetarians and vegans, enviable. Yet Butler tells us this in the context of being in a restaurant ordering a burger, that is, a dead-flesh type burger. What gives? Well, long story short, Butler compares eating sustainably raised, grass-fed, “happy” meat with eating vegetarian meat analog products, like Boca or Morningstar burgers. In this kind of comparison, the energy inputs to veg food don’t compare so well to meat burgers, because both meat and meat analogs require considerable processing. She cites a 2009 study by the Swedish Institute for Food and Biotechnology, stating that while producing a plate of peas requires a fraction of the energy needed to produce the same number of calories of pork, the energy costs of a peaburger and a pork chop are equal. Worse, some veggie burgers, including the above-named brands, use a nasty chemical called hexane, a suspected neurotoxin, to remove oil from the soybeans. So because of this, some people Butler quotes are deciding that happy meat is a better choice than plant food? Come, come, let us be reasonable. Since when have meat analogs been a required part of a vegetarian diet? They’re easy, sure, usually tasty, and very helpful in converting meat-eaters who want to do better but haven’t yet had time to understand what’s for dinner if it’s not flesh. However, even vegetarian health experts like Drs. Michael Greger and Michael Klaper have urged vegans not to overdose on the analogs. What we should be eating are whole grains, legumes, vegetables, nuts and fruit. 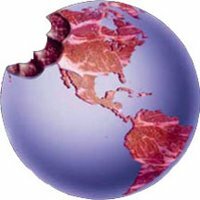 Space does not permit me to go into numerous other environmental negatives of happy meat, nor does Butler even mention the health hazards of eating meat nor the fact that meat requires animal slaughter. She concludes the article by saying that she plans to eat mostly plants with the occasional serving of meat because she finds meat tastier than fakin’ bacon. What about black beans and quinoa, or a rice and veg stir fry, or vegan pizza loaded with vegetables, or . . . or . . . or . . . So many delicious foods await that are healthful, humane, and admirably low in energy inputs and resource consumption. The attempt to justify meat consumption on the basis of misunderstood environmental ethics just doesn’t cut the (vegan) mustard.